I like to post a lot of fish pictures on my blog–I cannot get enough of big fish pictures and I have learned there are a lot of other folks that think the same way. One other purpose in doing that is to again let folks know that our Nebraska fisheries workers are always busy, always doing something, and our fisheries biologists spend a lot of time in the field handling a lot of fish. No, we do not necessarily try to collect the largest fish present, and if you want reports of big fish, anglers see more than biologists do even though we may use specialized gear to collect a lot of fish. But, we do see a lot of fish and on occasion we see some special specimens. The first comes from southeast Nebraska, a Salt Valley reservoir. That is all the biologists would tell me. Now I know there is nothing for perspective in that photo except for the measuring board. And yes, we measure fish in metric, millimeters. So, I am going to give some of you math whizzes a few seconds to catch up here, let’s see a bluegill of 290 millimeters is . . . .
HOLY COW! That bluegill was nearly 11 1/2 inches long! That was a BIG bluegill, and it was sampled from public water. Now, understand this, out of hundreds of bluegills, only 1, O-N-E, uno, a single bluegill of that size was sampled, and that proves a point I often make–big fish are hard to catch not because they are so smart, but because they are so rare. But, it shows that you just never know, there can be some trophy specimens out there. Now, I know I am going to be criticized for not blurting out the exact body of water where those quality bluegills were sampled. I will tell you it is in the Salt Valley, do some exploring, bluegills ain’t hard to catch, you can figure out which waters have the best bluegills. 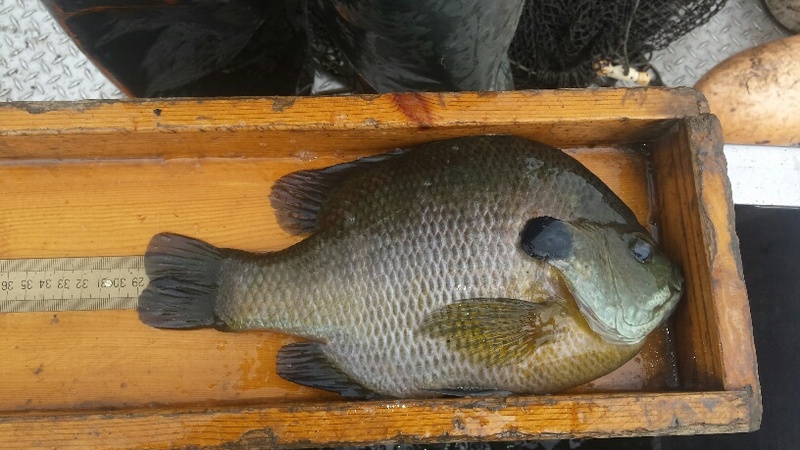 Keep this in mind, the bluegill spawn is coming up, and the biggest bluegills in a population can be especially vulnerable to harvest during the spawn period. Those big, nest-guarding males can be “cherry-picked” off their beds. 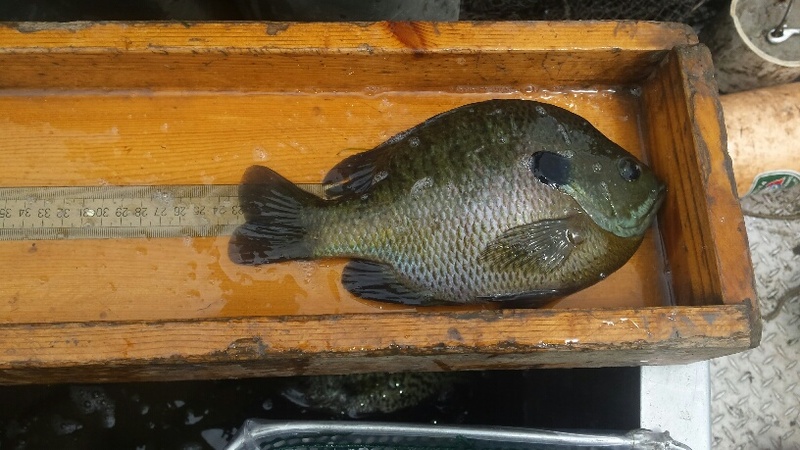 With the unique reproductive biology of bluegills (Bed Time for ‘Gill) the big males that guard the beds are the fastest-growing, most desirable fish to LEAVE in the water, in a population. Whack those big, nest-guarding males and a bluegill population is much more likely to become “stunted”–dominated by small, slower-growing fish. There are a lot of panfish populations in Nebraska waters that suffer from over-fishing of the biggest, most-desirable fish. 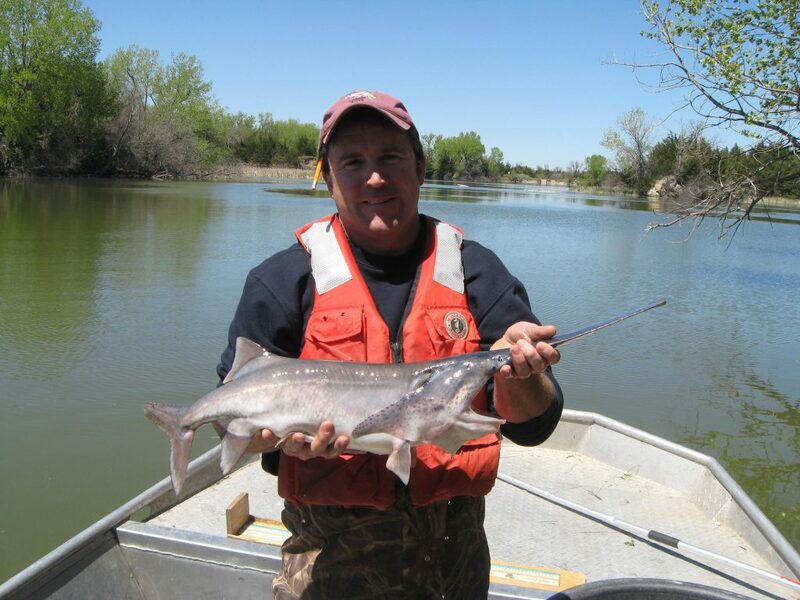 Fisheries biologist Jared Lorensen with a canal paddlefish. 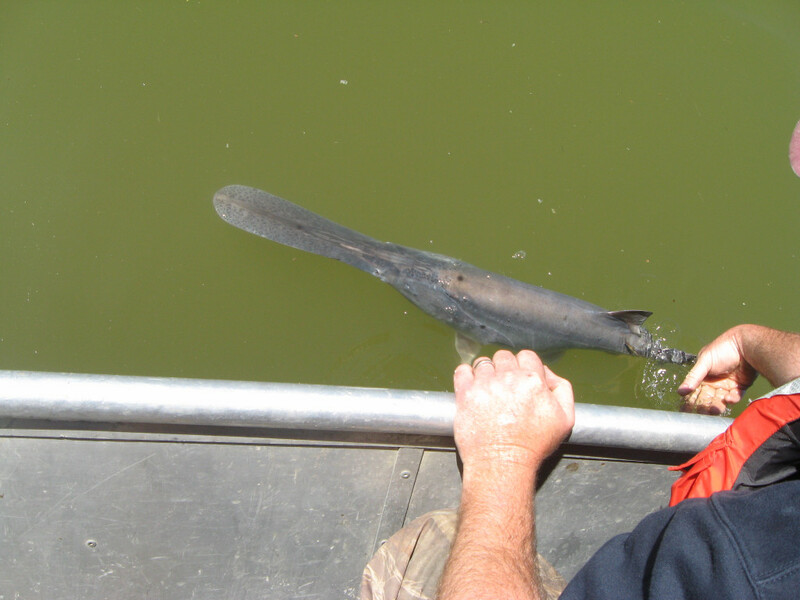 That fish was the only paddlefish they collected in some sampling done specifically for paddlefish. Yes, we have documented some survival and excellent growth, but we are not anywhere near opening another Nebraska waterbody for paddlfish fishing. Maybe someday. That fish was a fat little piggy, 25 1/2 inches long and 6.8 pounds. Yep, all of the fish mentioned in this blog post, and a whole lot more, are back in the water, swimming, lurking. . . .